Books available on the History of Blackwood, Victoria. “The History and Pioneers of Blackwood” is the next book hopefully to be published soon with the help and voting from people through the ‘Pick my Project’ funding. 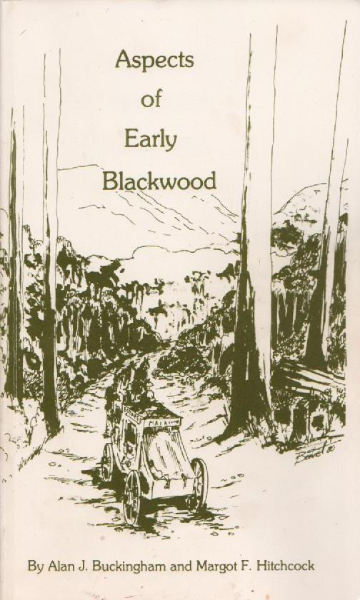 see page – THE HISTORY AND PIONEERS OF BLACKWOOD. Margot started researching for this book in 1980 after the publication of her 1st book – ‘Aspects of Early Blackwood’ in 1980. Now and after having in total, 5,000 books printed in 5 publications and only about 20 of these books left, it is time for the next book to be printed. The new book after 38 years of research is currently 700 pages and a wealth information of early Blackwood history. The money to be granted, if successful, through the ‘Pick my Project’ funding should be enough for an E-book to be made as well as a printed version. Update February 2019 – Unfortunately I was not successful but hope to have the opportunity for another grant soon.. WATCH THIS SPACE..!!! **** AS FROM SATURDAY 30TH JUNE 2018 THE HISTORICAL MUSEUM WILL BE OPEN ON MOST SATURDAY MORNINGS FROM 11am – 1pm – unless members cannot be there. (if planning to go check with the President, Allan Hall on 53 686 537 to make sure the Museum will be open). Stop press – OPEN DAYS FOR MUSEUM – Every 1st Saturday in the month from 11am – 2pm and Historical society meeting from 10.0am – 12 noon – new members welcome. To contact members of the committee – phone Allan or Elizabeth Hall, President and Secretary – 03 53686 537, or Historian write C/- P.O. Box 447, Blackwood Post Office 3458. Donations of Blackwood history and memorabilia Welcome. Historical Exhibition Open Day – 11.00am – 4.00pm. Labour Day holiday Sunday 11th March 2018. Historical Exhibition Open Day – 11.00am – 4.00pm. Easter Sunday 1st April 2018. All Welcome – gold coin donation entry. The Blackwood Historical Museum is in Martin Street on the corner of Warner Street next to the Special Schools building which is next to the Fire Brigade building. Postal Address – C/- P.O. Box 447, Blackwood Post Office 3458. 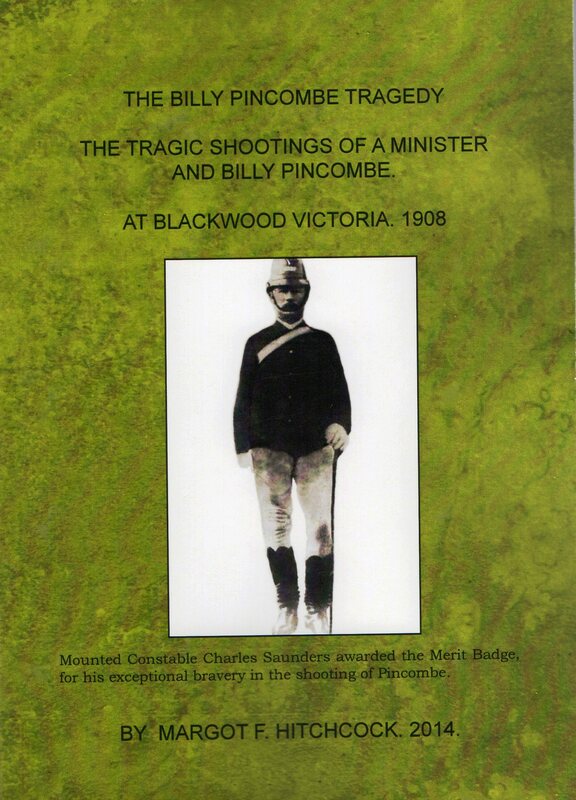 Tragic shootings of a Minister and Billy Pincombe at Blackwood, Victoria in 1908. 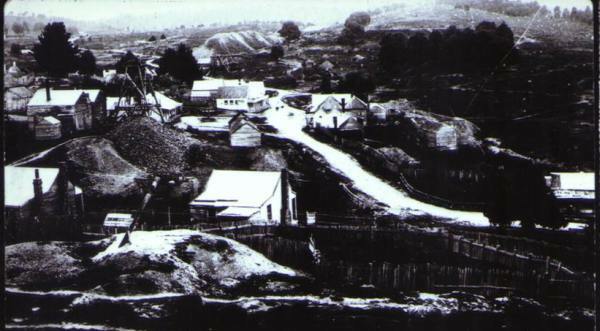 One of the biggest tragedies that ever happened in Blackwood, Victoria took place on the 19th June 1908. Events leading to this incident involved a man, his wife, the local preacher, the local policeman, the bible, some guns, an axe and a deranged woman and some of the people of Blackwood. Margot Hitchcock, Historian for the Blackwood and District Historical Society, launched her self-published 3rd book on the history of Blackwood on Easter Sunday 2014 at the Blackwood Historical Society’s Museum. The book ‘The Billy Pincombe Tragedy’ is a true story of Murder, Mania and Madness that happened with the tragic shootings of a minister and Billy Pincombe at Blackwood, Victoria. Historical true crime. The events that lead to the institutionalization of one person for Religious Mania after she chopped off her right hand, and the shooting of two people in Blackwood, over one hundred years ago in 1908. The A5 book has 178 pages with index and 55 photos, and sells at $16 plus $2 postage in Australia. GET YOUR AUTOGRAPHED COPY OF THE LATEST RELEASE – ‘The Tragedy of Billy Pincombe’ – limited to only 500 copies. Order your copies NOW. – Price – $16 plus $2 if postage in Australia. and General Historical meeting 10.30 – 12 noon – new members welcome. By Alan J Buckingham and Margot F Hitchcock. 89 pages including photos and index – with information on early gold mining days and the pioneers – Cost $15 or $17 including postage in Australia. compiled by Margot Hitchcock for the Blackwood & District Historical Society. 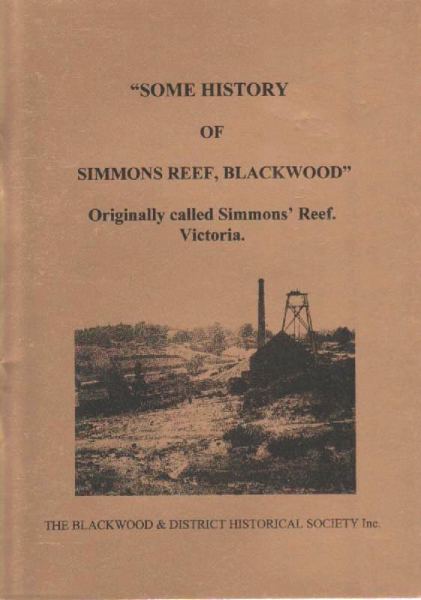 55 pages and 51 photos plus index with information on the early Quartz mining in Simmons Reef – Cost $13 pr $15 including postage in Australia..
Hi, you have reached the Web-Page of Margot Hitchcock, Author and Historian for the Blackwood and District Historical Society, of Victoria, Australia . ● You would like some information on your ancestor who lived at Blackwood ? Another book soon to be published— “The History and Pioneers of Blackwood” – over 600 pages of fascinating history of Blackwood. Margot is trying to find time to finish her research and publish another book on the history of Blackwood, hopefully to be published in 2015 with the title ‘HISTORY AND PIONEERS OF BLACKWOOD‘ . click here. Please note – to the overseas people who try to post rubbish/trash comments on my page, they will be put in the Spam box and not posted – so don’t waste our time. “Blackwood Publishing | Genealogical history of Blackwood Victoria” ended up being a superb blog. P.S. I’ve been working on my web page for 3 hrs today – hope you are happy with what I’ve added – more to come. What a great website. Well designed and easy to use. Quick question when is the Historical Society open? I’m travelling passed there this weekend and was hoping it might be open. Also do you know were Pleasant Hill was? I found references to it in Wills of my Great Great Great Grandparents. Thanks David for your enquiry on my web page… glad you liked it…. a lot of work for me but glad you found it easy to use.. I had fun designing it – still more to do but there was a need so I thought I’d better do it. hmm where was Pleasant Hill was? – at this stage I’m not sure – depends who lived there.. do you know….???? who were your Great Great Great Grandparents. William Byres (2nd) (born 1850) married Annie Pryn on the 1st February 1877 at Blackwood. Annie Pryn was born in Blackwood on 29-5-1860. The Pryn family lived up behind Walls house on the Old Golden Point Road, on what became known as “Pitch Fork Hill”. Getting its name from when Annie’s father chased one of the girls boyfriend’s down the hill with a pitch fork! Now the Blackwood Historical Society is open once a month on the 1st Saturday of the month from 10.30am – 12.30pm so next one is 6th July.. I see I’ve corresponded before with you re your Pryn family.. if I can help further let me know.. I have used images from your site to illustrate letters that I am transcribing from Blackwood (and elsewhere) during the diggings. Please let me know if using these images is inappropriate – or indeed if you would like to link to the site – or even better – if you have more that you could add to my letters! The recipient of these letters was my Great Grandfather (Isaac Edward Dyason) and most of the letters were written to him by enthusiastic Uncle (9 years older than him) Fred Pearce. Isaac’s diaries (now in the State Library of Victoria) describe his day-to-day experiences on the goldfields from 1851 to 1915. So far these have not been transcribed. The images I speak of are of Blackwood – but I have not uploaded these onto my site yet. Will do over the next couple of days. Hope to hear from you. Which Books Contain info on the Shaw Family??? Hello Margot, I’m interested in anything you may know about the history of coaching, in and around Blackwood and District. I have seen a picture of a coach outside the Royal Mail, pulled by only two horses. I don’t believe it would be possible to get up old Golden Point road, or Martin street from the coach road from Trentham in a loaded coach with only two horses. Perhaps the photo was taken during a team change and the leaders has already been led away? As the old coach rode is steep and dangerous, I would like to know if any photos of this route exist! Regards, Sean. this a great blog. found it by chance whilst browsing for photos of the Blackwood School, in the hope of seeing an image of my grandmother when she was very young. Her name was Alice May Ashton, born in 1891 in Blakeville. She came from a very large family of 15 children. I am wondering if in your study have you come across the family name of Wright? Children born/registered to have been born in Mt Blackwood between the years of 1855 -1869. Scandal was or said scandal, Mary Ann left her whole family and married Peter Jensen 1870. Hi Carolyn, I found mentions in the Bacchus Marsh Express on Trove of William Wright and Peter Jensen being partners in a mine at Blackwood on Wright’s Reef. If you want more info on this let me know…. I found the births of 5 children to Mary Ann Panton and William Wright at Blackwood in 1861,1863,1865,1867, and 1869. I found a child born in 1859 at Blackwood to William Wright and Mary Ann Pentland – although I think the surname Pentland could be a mistake.. so this looks like they were not married before she got married in 1870 to Peter Jensen.. strange one for sure.. I then found the marriage in 1870 of Mary Ann Panton born Tasmania, married to Peter Jensen born Norway reg. no. 1182. THIS is to certify that I WILL NOT be ANSWERABLE for any debts or liabilities contracted by my wife, JANE JENSEN, she having left my home without my consent. : Dated at Mount Blackwood this fifth day of September, 1866 PETER JENSEN. So I then persuaded this research and found a previous marriage of Peter Nicolay Jensen in 1857 to Jane Mitchell Shaw reg no. 3187. George Peter Jensen was born to Peter and Jane Shaw at Blackwood in 1862, and Christina born to same parents in 1861 at Blackwood reg no 1830. and Helena born to same parents at Blackwood in 1865 reg no. 13590. So now I’m more confused – were there two Peter Jensen’s or did he have children to two women in Blackwood at the same time..???????? I also found the obituary of Peter Jensen if you want it let me know.. I hope you can verify some of this and put me out of my confusion..!!! I am trying to find more information of my ancestors from the Blackwood area. Mathew Sweet (alias Haskins) born 27th June, 1808, died 7th May,1886.His parents were John & Elizabeth Haskins, Bristol England. I know he was transported out to Sydney Cove on the convict transport ship “Champion” on 24th May 1827, to serve his 7 year sentence. He was granted a “ticket to leave” on 15th Dec, 1832, then his “Certificate of Freedom” 22nd Nov, 1833. He moved to the District of Port Phillip, now Victoria and worked for Mr Willis on Willis Station in the Upper Glenelg area , where he met Mary Kelly. He married Mary Kelly and with their large family of children, packed up moved to Golden point, Blackwood, to pan for gold with George Jackson around November, 1854?. Mathew is my 3rd Great Grandfather. I would be very interested in any information that you could send me regarding the life of Mathew and his family, also are there any relatives remaining in the Blackwood area, I would love to know more about them also. My maternal grandfather was George James Mcausland Gelletly brother to John Gelletly. My mother was Jean Margaret Crowley( nee Gelletly ) daughter of George. I will look forward to any information that you may be able to e-mail me on any further information on my “Kinship” family. thanks for your query on my website.. yes I have info on Matthew Sweet in my Aspects book and a chapter on the family in my next unpublished book – The History and Pioneers of Blackwood. I did not know he had been a convict – is it OK if I use the info in my next book…??? Have you been to Blackwood and seen his grave and headstone..??? yes there are still families by the name of Sweet in the area. I have a photo of the Gelletly grave and headstone – have you seen it..??? what sort of info do you want me to give you..???? I am trying to track anyone or organisation who might kn0ow the fate of the Barry’s Reef Post Office. I have seen on the interent that a house called Anderson? is now what once was the P.O. However my family believe that the ruins of the old P.O may be visited nearby Thompsons road? My Great Aunt was Post Mistress there. Hi Frederick, yes I knew of another post office in Barrys Reef. In my next as yet unpublished book – “The History and Pioneers of Blackwood” I have – Fanny Wilson, the eldest daughter, was obviously intelligent, and was said by the relative to have been the Post Mistress at the Barrys Reef Post Office. Also another note I made in my book says – “I found the old Post Office which was all fallen down, but now I believe there were two post offices at different times and locations in Barrys Reef, Blackwood. One old man (Les Armstrong) said he used to live in Barrys Reef at a Post Office where his mother had been postmistress. He used to live at the other Post Office which was the one which had all fallen down. A Thompson family lived in Barrys Reef in the 1860’s and 1870’s. Mrs Louise Thompson (nee Armstrong) ran the Post Office where Les Armstrong lived with his mother in about 1910. Les Armstrong was born in Barrys Reef in 1903 where his mother was Post Mistress for many years. What was your great Aunt’s name….?? this post Office was in a road off to the right going from Blackwood to Trentham… I have a photo I took of the old post office which I will email you as can’t see how I can attach it here. hope this helps. Margot Hitchcock B.D.H.S. I came across this website a bit by accident whilst doing a search for Thomas Guppy. In fact my connection to the Guppy family is Mary, who married John Andrew on 23 August 1870 in St Peters Church Melbourne. For years I have been trying to find a connection with the Andrew family with Cornwall, but have been unable to, but your record says John was born in Cornwall. (however, his Australian death record records his birth as Kings Stanley, which is in Gloucestershire about 10 miles from where I live). John appears to have traveled to Melbourne with his brother Joseph (and his death records says he was born in Cornwall). John & Joseph are my half great grand uncles, their parents were James Andrew (my Gt Gt Grandfather) and James’ first wife Sarah Andrew, nee Fisher. If you would like further information about John & Joseph and the Andrew family, in the UK, please let me know and I would be very happy to supply you with any information I have. I would really be interested in hearing of where the information about Cornwall was obtained, as this would certainly help me break down a brick wall as to where James Andrew was born, and details of James’ father John. Thanks for your query on my website… The Andrew family info on my web site I got from Mary Wormald, great grand-daughter of Christopher Guppy, and Wendy Abey, granddaughter of Mary (Polly) Andrew married to James Lidgett. I looked up John Andrew’s marriage in 1870 to Mary Guppy in my Digger records and it says he was born in Gloucestershire – so I think that info would be right as he would have know on his marriage where he was born.. But interestingly enuf there are 4 others by the name of John Andrew who are listed as born in Cornwall. I have a Digger record of a Joseph Andrew born Cornwall married Catherine Rowe in 1887 – is this yours..? I have the record of the death of John Andrew in 1926 and it says- father James Andrew – mother Sarah Fisher – died Ballan Victoria, age 92 (born 1834). Reg. No. 116. So that matches other records I have. ANDREW – On the 22nd March, at Doctor’s Creek, Ballan, John, dearly beloved husband of Mary. and father of Walter J Andrew (Sunshine), Mrs Thomas Fagg (Ballan), Mrs Robert Hornbuckle, (Myrniong), Mrs James Lidgett (Myrniong and Frank Andrew (deceased), aged 92 years. Passed peacefully away. Ballan is the next big town to Blackwood. Found this site quite by accident as I was trying to find the birthplace of ‘Glue Pot, Blue Mountain, Victoria’ for John Thomas HUTTON born 1863. The sibling before him, David Downey HUTTON, was born in Taradale in 1859, and the three siblings after John, Jane, Teresa and Mary, were all born in Blackwood in 1867, 1869 and 1874 respectively. By 1877, the family were living in Waratah, Tasmania. There is some confusion as to whether the father, Robert Joseph HUTTON, from Edinburgh, was a miner or worked for the mines as a clerk/accountant. The mother was Catherine DOWNEY originally from MIddlesex and they marred in South Australia. Some information I found on RootsChat suggested from a letter written by a gg aunt that Catherine was very educated and visited Blackwood as a young girl and photographed a library Robert HUTTON kept there. Another story was that Robert was the editor of a Melbourne Newspaper and went to report on the shipwreck of the barque Sacramento, on which Catherine was travelling with her sister, and that is where they met. Thought it was worthwhile seeing if you were able to shed any light and I thank you in advance for your assistance. Hi Merrelyn, Glue Pot, Blue Mountain is just north of Blackwood.. called Blue Mount now… yes John Thomas HUTTON was born 1863 at Blue Mount, father was Robert Joseph Hutton and mother Catherine Downey reg. no. 19086. But I have David Downey HUTTON, was born in Taradale in 1861, not 1859. Robert Hutton died in 1890 age 49 yrs. Yes he as involved in the Mechanics Institute library at some stage.. They has 7 children, two born previously in Adelaide after they married there in 1857. he family moved to Tasmania in 1874 and Robert Hutton died in Tasmania in 1880, and Catherine re-married in 1883. I would be grateful for any information on the family of Edward Morrison who settled in the Blackwood/Pentland Hills area in the 1850’s. Edward was a builder/contractor and they came from Putney, Surrey, UK. Also info on William Duchesne who was a carrier and married Annie Morrison in 1859. Thanks Margot for your prompt response. I am actually researching on behalf of a descendant of William Noble. This William married Jessie McIntosh at Mansfield Vict. on 4.11.1863 and had the following family: Grace b. 2.1.1865 at Woods Point Vict., Alexander b. 22.8.1866 at Nth. Melbourne. Vict., Jessie Louise b. 22.1.1870 at Bonag East, Vict. and William b. 1877 at Bega NSW. It appears that John married Flora McGlip at Queensland, probably in the 1860’s. If the John and William Noble listed in the advertisement in The Argus on 22.5.1856 are the same as the above they would have only been single men aged 22 and 20 respectively and would have moved away, certainly by the early 1860’s, if not before. The impression I have is that these two young men arrive in Australia as surveyors labourers in 1854 (per shipping records), hear about the discovery of gold at Blackwood, and after fulfilling their surveying obligations hotfoot it down to Blackwood to try their luck. Perhaps disillusioned after a few years they move on, find bonny Scottish lassies for wives, settle down and have a family. However, William did become a teacher, so the reference to a Noble teaching at Blackwood does interest me. I started looking for the other Noble file at midnight and then found it and took to bed to read..!! I have a lot of info on the other William and John Noble and photos…BUT this family are from Co. Fermanagh in Ireland. A John Noble married Letitia Bell in 1816 and had 5 children – two of which were William born 1824 and John born 1826.. but if your William age 18 and John age 20 in 1854 were the same men as mine then that would make my John 28 in 1854 and William 30 yrs old. So somehow I think they are different families. Given one is from Ireland and one Scotland and the age differences. As I said the William I have had children born in Blackwood. William’s children were with his wife Ellen Beatty – a daughter Eliza Jane born to them at Blackwood in 1858, and Ann in 1861. Eliza Jane and Annie Noble were both school teachers in Beechworth area where they married. Eliza Jane Noble was a student teacher at Simmons Reef in 1875 according to my Simmons Reef book.. Although I do have a Catherine Noble daughter of William Noble and Ellen Beatty married in 1888 to James Benford and they moved to Mansfield and retired to Albury. And you have a William Noble in Mansfield, but seems like different years – 20 years apart. So I don’t know if your Noble family from Scotland are related to the Noble family from Ireland I have living in Blackwood.. Confusing with both families having a William and John Noble in Blackwood. I’ll leave it to you now to sort out and tell me what you think. Pity as I have some nice photos of William Noble in 1891 to celebrate his 50 yrs since he arrived in Victoria in 1841. And one of William Noble and his bride Isabella Maguire in 1888. I would love to have any information you have on William Noble and Ellen Beatie – I have been chasing this family all over – I do know William came out on Catherine Jamieson in Oct 1841. His mother had remarried (her name was Letitia Kenny) and her 2nd husband’s son John is well -known in Bridgewater area and I know that Letitia and her husband were there in 1850, but it is very difficult to trace the movements of the 2 Noble siblings that came out at that time and there are many stories that have been attached them(William and Mary Jane Noble) Ellen Beatie had come out as an immigrant under the Earl Grey Scheme. (not paid for by William) and I have been given a story about Ellen’s death in Blackwood that I am trying to confirm. My interset in this family is in trying to sort out the 2 Noble family that came out in the very early days of the Colony. My grandmother was a Caldwell and her grandfather James William came out in 1851 – he had 3 siblings that had arrived in the colony in Jan 1839 and the youngest sibling Sarah Jane married James Noble in Geelong (Noble street named for him) I thought that I had the story straight until another researcher came up with this other family that had come out in 1841. So I have been following this line and trying to confirm the details I had been given. So as you can see I would be interested in any details you can supply me with. If this means purchasing one of your Society books – that is fine. Just let me know. I do know that William and Ellen were in Blackwood, but I don’t know what they were doing there, and most importantly whether the quarantine at the time of Ellen’s death is correct, as I have not bee able to locate any newspaper articles. Sorry for the length of this email, but I hope to hear from you soon. PS I can supply copies of items I have already got here. Thank you for your query of my web page – I have mention of Noble children attending the Simmons Reef school in my book “Aspects of Early Blackwood”. William Noble married Ellen Beatty/Beattie who was the daughter of John Beatty. They were married in St. James Church, Melbourne in 1850 when she was 17 yrs old. They had a child Catherine Noble born in Brunswick in 1853. William Noble and his wife Ellen moved to Simmons Reef in 1855 and are listed in the Electoral Roll in the Argus in 1855. Their children born at Blackwood were John Noble in 1855, then Eliza Jane Noble in 1858 and Annie Noble in 1861. After Ellen Noble died in 1863 giving birth to her 5th child, Letitia Kenny brought up Ellen’s children. Letitia had first married to John Noble snr. hence the family connection. I have a photo of the Kenny grave in the Blackwood cemetery, and a photo of Annie Noble and Eliza Jane Noble, And John Noble and his wife Isabella, and William Noble sent to me by a relative of yours Barry Noble – have you been in touch with him..?? he has sent me a lot of family info.. do you have it..?? Hope this helps a bit with your family research. I am looking for my step father’s sister. They were both sent to Barnardos in 1919 after the death of their mother. My step father was 5 and his sister was 3. He was sent to Canada and was used as a slave on a farm being made to sleep on a landing. His sister was sent to Australia and on 15 September 1936 she married and lived in Bridgetown, Western Australia. I think she had a better time of it than her brother. However I have been unable to trace her if indeed she is still alive. My step father died of sclerosis of the liver at age 56. He had been in 2nd world war to escape from the farm he was sent to and then came back to England. He did drink Whiskey which is not surprising. I have grandchildren myself now aged 5 and 3 and cannot imagine how difficult it must have been for those two little children to be separated when they only had one another. The older daughter age 7 was taken by the grandparents I understand. I am sure his sister would want to know about him or any of her descendants but I have been unable to trace her. I have now discovered she died 3.3.2011 (95) Married J H Drummond 15.9.1936 used name Winifred Kathleen any information concerning remaining family would be appreciated. Hi Roberta, You have not given any information on the names you are looking for but if you supply some more details someone may be able to help you trace them. I look for ancestors connected to Blackwood which Is the area I am familiar with and have records for. Kris – There are some excellent books written on the Barnardos Homes, particularly the one in WA., however it was not something to be proud of. The Canadian Archives and shipping records should show where her relatives were sent, as I found one of mine through that. One cannot imagine how hard it must have been for these poor children. Slaves they were. Kris – http://www.thepeterboroughexaminer.com/…/autobiography… and David Hills’s The Forgotten Children. I have read another as well. Lesley – Some of these children without a doubt had it tough that is a well known fact and some were ashamed however my mother still alive at 91 years of age and has never had a bad word about where she came from why she was placed in the care of Banardos etc in fact all our lives as children growing up we were reminded how special we were and how fortunate we were …Barnardos still take an acive roll in my mothers life …she was one of 16 children from three unions and the only one of her family who came to Australia 1934 her brother remained in Barnardos in England and never spoke about it…only to say it was tough on reading his paperwork from the Home he was a troubled young man until he joined the Royal Navy as mum said it was a lottery you either had it good or bad…..